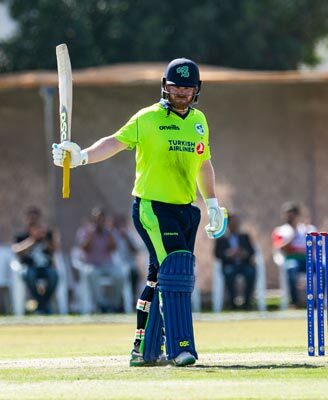 PAUL STIRLING led from the front with a hard-hitting top score of 71 as Ireland opened their T20 quadrangular tournament campaign with a 15-run victory over hosts Oman in Muscat but the win was by no means straightforward. With captain Stirling bashing 11 fours and a six from 51 balls faced, Ireland were cruising on 122-1 at the end of the 14th over but the dismissal of Andy Balbirnie for 34 led to a clatter of wickets and it needed Lorcan Tucker’s 22 not out to lift the Boys in Green to 159-5. The reply began apace and Oman were well on course to repeat their shock victory over Ireland at the 2016 World T20 in Dharamsala before Simi Singh turned the game on its head with three wickets in an over and the home side failed to recover momentum as they stuttered to 144-9. It was Singh’s day for upsetting the applecart as the former YMCA all-rounder earlier announced that he has decided against a well-publicised move to The Hills next season and will instead play his Leinster club cricket with Phoenix. Singh’s figures of 3-15 from three overs show not only why he is such a sought-after commodity at home but also his value to Ireland in the shortest form of the game, with the opening attack again leaking runs at nearly 10 an over, albeit with little luck. New cap Shane Getkate, who became the 700th man to play for Ireland, bowled two tidy overs for seven runs to make sure Singh’s work didn’t go to waste and Pembroke left-arm fast bowler Josh Little can be happy with his return of 2-24 from four overs. “There was a lot less grass on the wicket than over the last few days - so it wasn't too bad a toss to lose,” Stirling said. “We got the minimum score we needed to get - and we knew if we got a couple of quick wickets we'd put them under pressure, and that's exactly what happened. “The captaincy has been good fun, and I'm just happy we got across the line. We didn't really know what a good score was going to be. From a personal point of view it was good to take a few balls and get myself in and make a decent enough score." A victory over Scotland tomorrow could be enough to enable Stirling to get his hands on the trophy but it will more likely set up a winner-takes-all final match against the Netherlands on Sunday. The Dutch beat Scotland with a ball to spare in yesterday’s other game.